Changes and additions have been fluid over the years. In 1981 they hired Bruce Goff, the architect that introduced Ruth to Wright, to design a Master Bedroom, add a two car Garage, enlarge the kitchen, create a formal dining room, and create a Library in place of the old Workspace. According to Randolph C. Henning, the Blair residence (to the best of his recollection), is the only time the architectural genius of both Wright & Bruce Goff physically came together in an architectural work. He also mentioned that Grant Gustafson and Michael Kreps were the Bruce Goff apprentices who were responsible for the drawings for the 1981 additions. Two sets of plans exist for the 1981 alterations. The first set, which includes ten pages and is undated, lists Bruce Goff as Architect and J. Palmer Boggs as Structural Engineer. This set indicates that the kitchen has been moved from the "Workspace" to the original "Workshop" area. Bruce designed a two story addition touching the Northern corner of the Living Room, and a Garage and Storage areas off the Southern end of the home. The plans also included a number of built-in planters to be added around the exterior of the home as well as a pool by the entry. The two story addition includes a Hobby Room, Plant Room and full Bath on the main floor. The second floor includes a Master Bedroom, full Bath and two Decks. The addition on the Southern end of the home includes a two car Garage, and three Storage areas. The second set of plans is dated Nov. 4, 1981 and includes 17 pages. It lists Bruce Goff as Architect, R. Michael Kreps Architect - Drawing, and J. Palmer Boggs as Structural Engineer. This set indicates that the kitchen has been moved from the "Workspace" to the original "Workshop" area. Bruce designed a two story addition touching the Northern corner of the Living Room and a Garage and Storage areas off the Southern end of the home. The plans also included a number of built-in planters to be added around the exterior of the home, a pool by the entry and a second in the back yard attached to the terrace. Bruce also designed a pedestal for the Yellowstone Canyon Hotel light fixtures. The two story addition which is larger than the first design, includes a Living Room, Studio, Utility, Bath and Aqua/Arium on the main floor. The second floor includes a Master Bedroom, full Bath and two Decks. The addition on the Southern end of the home includes a two car Garage, and three Storage areas. Additional changes to the original structure include expanding the Eastern corner of the new Kitchen (Old Workshop) and adding windows and a planter. It also includes removing the original Workspace on the Southern end of the Living Room, opening up the area to create a Library. These plans also indicate that all the interior doors and window partitions between the Terrace and the Bedrooms have been removed except a panel on each end, and suggest removing these, completely opening up the area for formal Dining Room. The additions which were completed from these two designs included the Garage and Storage areas on the Southern end, expanding the Eastern corner of the new Kitchen (Old Workshop), adding windows and a planter, removing the original Workspace on the Southern end of the Living Room, opening up the area to create a Library and completely opening up and creating a formal Dining Room. After Bruce passed away, Charles Montooth was hired to design and complete a master bedroom. 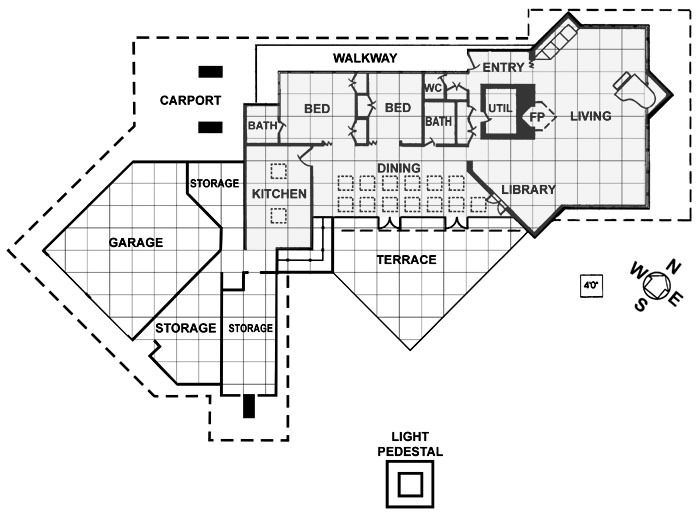 Floor plan copyright 1993, “The Frank Lloyd Wright Companion” Storrer, William Allin, page 372-373. 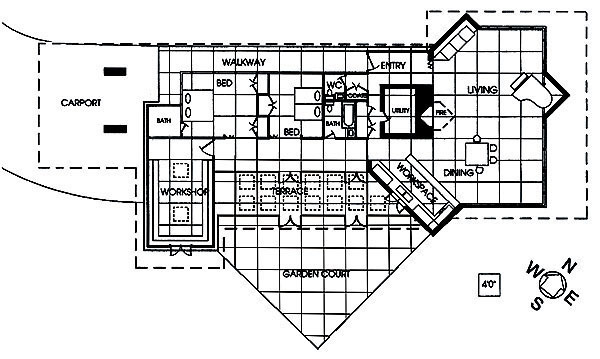 After further research and additional documentation as well as published photographs in the June 1956 issue of Household Magazine, the Storrer Floor Plan was modified by Douglas M. Steiner, copyright 2009. 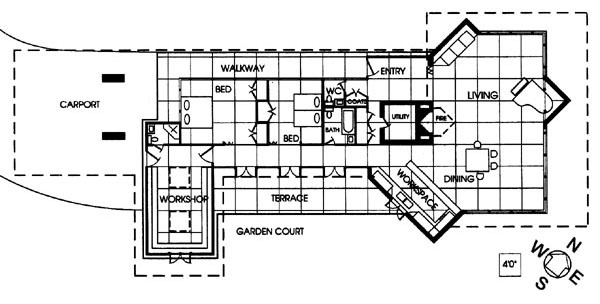 Floor plan after the Bruce Goff Addition. Drawn by Douglas M. Steiner. Gray tone indicated original structure. Copyright 2009. 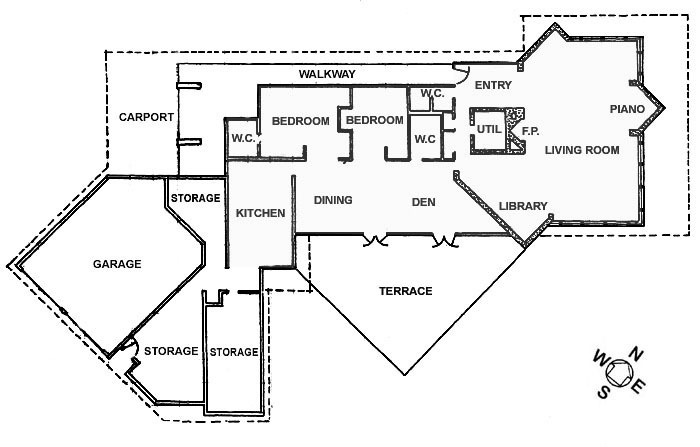 Floor plan copyright 1991, National Registry of Historic Places. Modified by Douglas M. Steiner. Gray tone indicated original structure.